The Dark Ranger: Bargain Price on Kotalik.. The New York Rangers signed forward Ales Kotalik to a three-year, $9 million contract on Thursday. The 30-year old split last season between the Buffalo Sabres and the Edmonton Oilers, putting up 20 goals and 23 assists. In the 2005-06 with the Sabres, Kotalik had his best season in the NHL, scoring 25 goals and adding 37 assists. The 6'1, 227-pound native of the Czech Republic was selected 164th overall by Buffalo in the sixth round of the 1998 NHL Entry Draft. Now, as unappealing as that looks right now, one must assume that Sather is trying to spread the talent around so that our opponents don't just have to focus on shutting down Gaborik to get the 'W'. With at least two solid lines that can score, any way you look at it, Gaborik should have enough space to put 40 or so in the net. Not a bad outlook, considering free agency isn't over, the season isn't starting tomorrow, and we still have King Lundy holding down the fort. Also, you can't count out the trade rumor that keeps popping up: Zherdev, Roszival for Heatley..Wow, I don't care about the cap hit Heatley would bring on, because that squad would be so much fun to watch. Especially since we won't miss Fatty, I mean Roszy back there..I would much rather see Sanguinetti or Potter for that matter gaining experience and earning far less as well as having Heatley and Gaborik up front. Of course this is all speculation at this point, but one cannot argue that the Blueshirts will have a different look and game altogether next season, and whatever happens, it should at least be extraordinarily entertaining watching them compete. Nice post syr11 -- welcome back to Dark-ness, where EVIL SATHER actually stupifies everyone in hockeyville by showing special unforeseen JEDI powers to get rid of Scott Gomez and play ball in free agency. Thanks for posting the news! Say good-bye to the Z-man. Not a bad exchange. 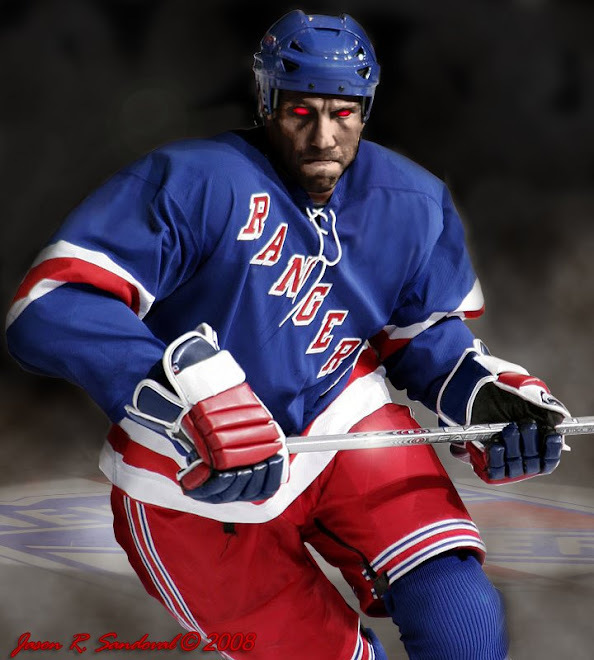 Rumors do abound that Richards will come to the Rangers and Roszy will be departing. So far we lost Mara... to Canadiens.